Technology: Anodizing Services are electrochemical metal treatment and finishing services that impart protective surfaces, wear resistance, and colors to non-ferrous metals such as aluminum and magnesium. Anodizing provides corrosion protection in what is called clear-coat anodizing and colors can be added for identification or aesthetic purposes. Hardcoat anodizing improves surface wear characteristics. Most anodizing is done using what is called a Type II or III process, which uses sulfuric acid as an electrolyte. Usually dc electricity is passed between the anodes and cathodes in the electrolyte solution producing an aluminum oxide coating on the part. Type II can be clear or dyed with any number of colors. Type III is a thicker coating and so improves wear resistance, hence the name hard coat, though the surface isn't really any harder. Because anodizing is a coating process it can add to a part's final dimensions. Except for parts in close tolerance applications, this is rarely a problem. Designers of close fitting parts need to make allowance for dimensional increase added by anodizing. Advantages: Anodizing services offer some advantages over other surface coatings such as powder coating. 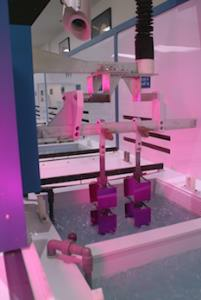 Applications: Anodizing services are used regularly where aluminum is employed as a material.